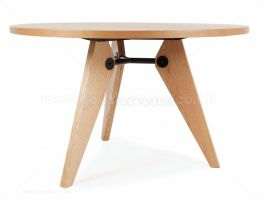 The design of most chairs puts most of the sitting load on a chair's back legs, where they bear the weight of their user’s upper body. 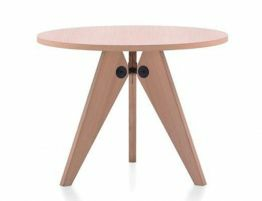 Tubular steel piping for the front legs has been used because they take relatively little strain, whereas the back legs, where the bulk of a person’s weight rests, were made of voluminous hollow sections and distribute weight in a more suitable way. 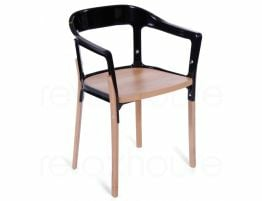 The chairs legs are constructed from powder coated steel and the seat and back are moulded plywood with an American Oak veneer. 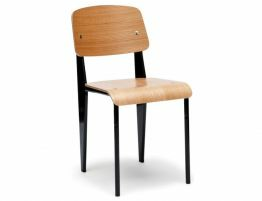 Like the original Jean Prouve Gueridon Standard chair the Mila Standard Chair - White Frame w/ Natural Seat rear legs look almost aeronautic, and the smooth rolling seat edge offers a softer curve and comfortable seat. 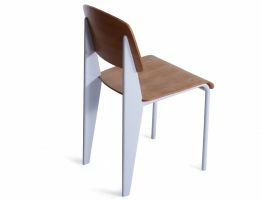 Our Mila Standard chair is robust, versatile and works equally well in domestic settings or as public seating in cafés and restaurants. 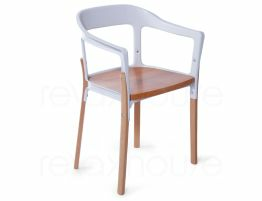 This chair is exceptionally sturdy and durable making it a welcome addition to your restaurant or café’s dining room.